In the daily production report, many factories include actual garment production cost from the day of loading a style. In this article, production cost represents sewing room cost. Factories consider all direct and indirect personnel who are involved in garment sewing and managing sewing lines in calculating garment production cost. In case, a production manager handles 10 lines then one-tenth of his daily salary is considered as cost incurred per line per day. If a floor-in-charge runs 3 lines (considering each line run single style) then one-third of his daily salary is considered as cost incurred in the production of a style. Following cost sharing method, the daily salary of all personnel is calculated for a style. If operators work overtime and others stay to assist them then overtime salary is also added to total daily wages. Overtime salary (hourly rate) may differ from the normal working hours. The formula used for the cost calculation = Total salary for the day/ Total production (in pieces). In the following table, an example of cost calculation has been shown that is normally used by garment manufacturing factories. In the above example – Production manager handles 5 lines and Floor-in-charge handles 4 lines. So, their salary is divided by 5 and 4 respectively as a contribution to each line. If you want to use this sheet for your factory, add manpower in the list and their actual daily wages (salary per day) according to your factory. During learning curve, production cost per piece will be high and as learning curve ends daily production cost goes down. At this time, the actual production cost is being checked with target cost. It helps a company to assess factory performance in term of meeting garment cost. Procedure of calculating actual garment production cost (Sewing section). 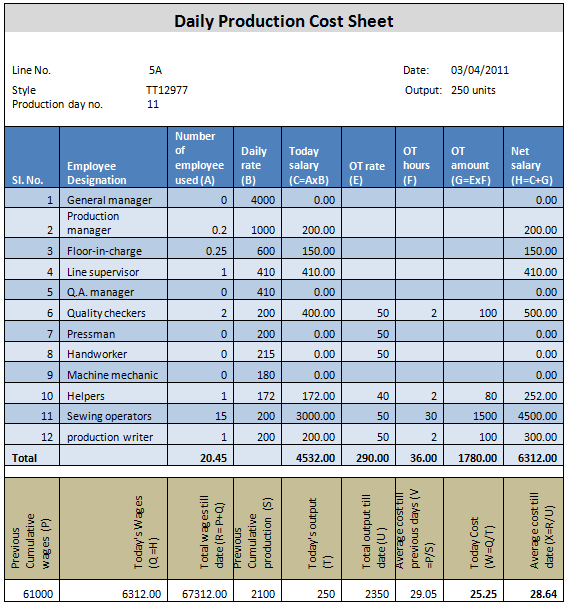 Staff and workers those need to be included in the process of calculating day to day production cost for each style are explain in this article.